The possibility of an ocean under the frozen surface of Jupiter's moon, Europa, has tantalized scientists for a long time. Now astronomers using NASA's Hubble Space Telescope are reporting further evidence of that ocean's existence. On at least three out of ten separate occasions in 2014, scientists at the Space Telescope Science Institute in Baltimore report they spotted plumes of water vapor spouting from the southern polar region of the moon's icy surface. The first ever observation of these suspected plumes was in 2013. This is exciting news. 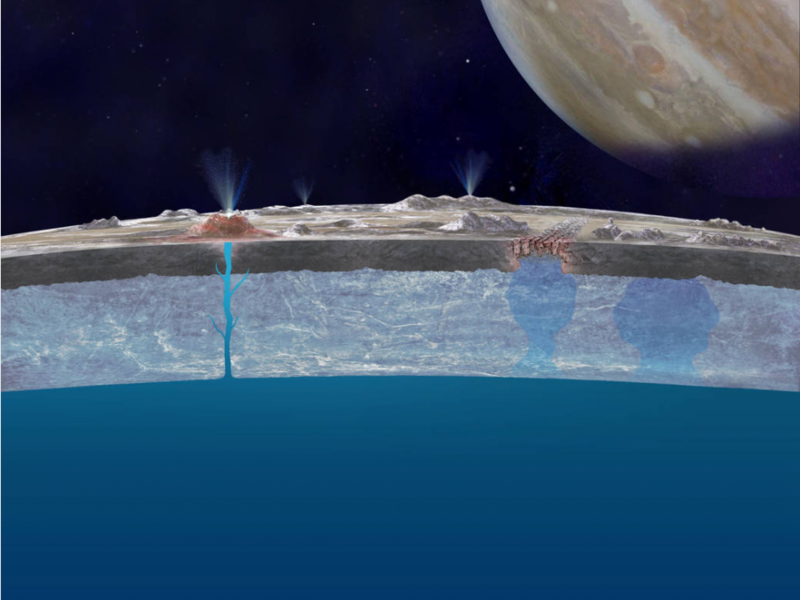 If the water plumes are real, and supplied by the ocean believed to be hidden under Europa's icy crust, they may offer a way to probe and analyze the ocean's composition directly. That could also pave the way for detecting any evidence of life deep below. 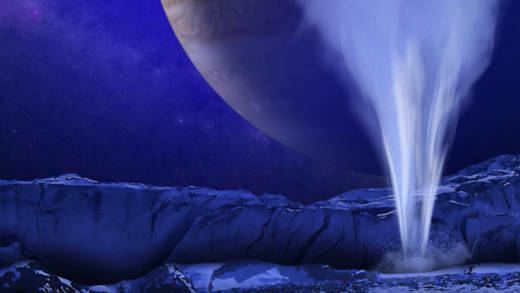 The likely existence of water on Europa makes it one of NASA's hotspots in the quest to discover extraterrestrial life. Direct exploration of a distant and deep ocean buried beneath layers of ice is currently beyond our capabilities, but missions to send probes through the plumes erupting from Jupiter's moon are already in the works. NASA's Europa mission is set to launch in the 2020's and the European "Jupiter Icy Moons Explorer" (JUICE) is scheduled for launch in 2022. NASA's Cassini spacecraft has already flown through and analyzed similar plumes of water vapor spewing from Saturn's moon, Enceladus. That's another hotspot location in NASA's quest to discover whether life exists elsewhere in our solar system. Scientists first speculated about the existence of an ocean on Europa when they observed the icy composition of its surface in the late 1970's. Later, pictures taken by the Voyager and Galileo spacecraft of Europa's so-called "chaos terrain" showed a peculiar jumbling of cracks and streaks in the ice. These were interpreted as being formed by an icy crust floating atop a deep liquid water ocean. An even stronger piece of evidence for a hidden ocean comes from NASA's Galileo mission, which detected a disturbance in Jupiter's magnetic field coming from Europa. 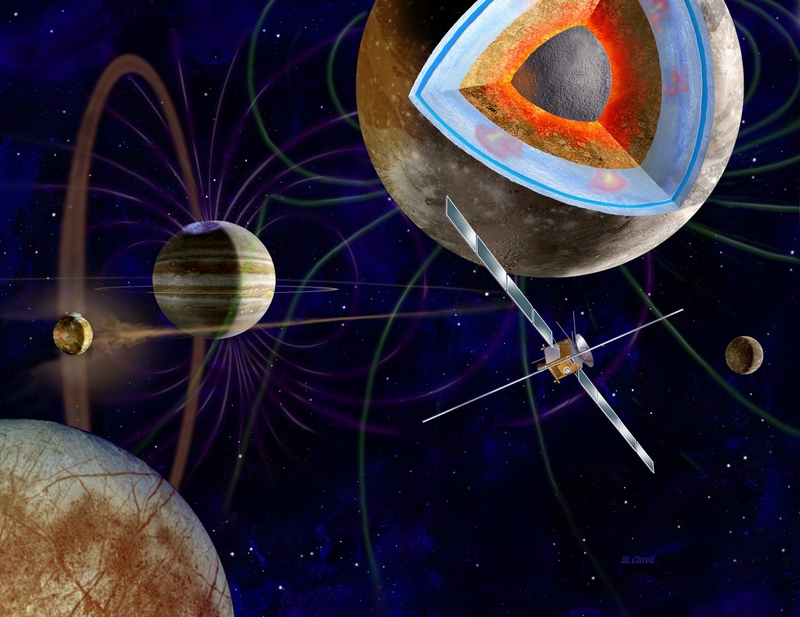 The disturbance could be explained by the interaction of Jupiter's magnetic field with an electrically conductive fluid inside Europa--such as a saltwater ocean. With what's believed to be a salty ocean thirty or more miles deep and containing two or three times the water of Earth's oceans, Europa may have the conditions needed to sustain life forms. Indeed, it's not a huge stretch to imagine an environment similar to certain places on Earth where life forms thrive under extremely harsh conditions. We call those organisms "extremophiles." Whether in the coldest bottoms of Antarctic or alpine lakes, or in the scalding hot and toxic waters of geothermal pools, or in pitch blackness on the ocean floor surrounding hydro-thermal vents, Earth's "extremophiles" have proven they can flourish under extreme conditions that could mirror those on Europa. Remember Arthur C. Clarke's 2010: Odyssey 2, involving a mission to Jupiter and a side-trip to Europa? The movie version gave us a brief glimpse of something green emerging from Europa's ice -- the enormous tendril-like vines described in the book that pulled a doomed Chinese spacecraft into the cold dark depths below. Clark's science fiction account of Europa made some of us thirsty to explore the moon's mysterious ocean depths. Yet today, almost thirty-five years later, direct exploration of those waters--say with some form of ice-boring submarine robot--isn't on the horizon. But scientists are zeroing in on a better understanding of what lies beneath Europa's frozen surface. As NASA's life-searching mantra goes, "Follow the water."